One might easily dismiss Benjamin Butler's paintings as blandly pretty or ironic "bad painting," a faux-amateurish retread of early 20th century Modernism. But they are, in fact, rather subtle paintings with a deceptive simplicity that belies a lot of art-historical knowledge and painterly know-how: the kind of work that takes time to warm up to. All of them in his recent exhibition "Some Trees" depict not so much trees, as a nearly schematic glyph: the idea of a tree. As in Untitled Forest (2012), for instance, the suggestion of branches is rendered as one or two veering curves attached to a vertical line—enough to convey "tree"-ness. Mondrian's trees come to mind, as if Butler is picking up an art-historical loose end and running with it, although, stylistically, they are more akin to Alex Katz. Similarly, Butler's nods toward Minimalism suggest an attitude of resisting both the idealism of pure abstraction and the picturesque qualities imbued in his subject. Initially, almost everything about these paintings seems to assert their status as an object. Paint is applied in ways that are unassuming and spare: either dry and scumbled or in very thin washes. These techniques emphasize the grain of the canvas, its materiality. Green Forest (2010-2012), a piece comprised of five oddly-proportioned columnar canvases (each about 76" x 7"), similarly asserts the canvas as an object—not unlike Frank Stella's early work. 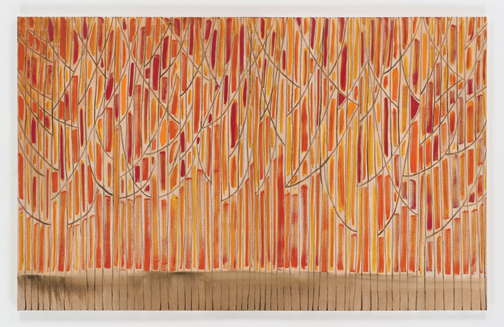 Also, like Stella, Butler's marks are sometimes laid down in tracks with slight space between them, as in Autumn Forest (Sixty-Three Trees) (2012). Without much over-painting, every step of his process is visible. This makes them performative in a way that feels both loose and fastidious—that is, deliberate and controlled but not precious or fussy. Butler's consistent allusion to trees complicates all of this insistent materiality. The overall flatness is contradicted by the tree motif, which lets space—an intimation of sky—open up behind them. This implies a horizon line situated (with one exception) outside the frame. That is, these are trees that we are looking up at, an attitude suggesting, it would seem, a kind of reverence for his subject (or, perhaps, for his early 20th-century sources). Forty-Five Trees at Sunset (2012), for instance, seems, at first, almost like a grid painting or a mosaic before suggesting, gradually, the sense of light emanating through a forest. It also has a surprising, very evocative, sense of place. Like Milton Avery, he can wring a lot of atmospheric effect out of surfaces that would seem, initially, rather abstract. In fact, the best summary of Butler's work might be contained in the John Ashbery poem from which he garnered his title (Some Trees): "That their merely being there means something"—though, perhaps in Butler's case, the reverse. For all their "meaning"—their paradoxes, ambiguities and art-historical name-checking—we are left, in the end, with the specificity of their simple presence.